Need a new camera for ghost hunting? Many of the items listed can be bought in our ghost hunting equipment store. >Please visit it here< BUY: Ghost Hunting Equipment ONLINE Store. EMF Detectors are Gauss meters that respond to localized gradients in electromagnetic field intensity. They are very popular in the tangentially connected fields of electrical power technology and also the pseudoscience of "ghost hunting" or other paranormal research. Their indicators are usually calibrated in milligauss. EMF is an acronym for Electromagnetic Field or, colloquially, Electromotive Force. In absence of moving magnetic field, an ideal meter will read 0 milligauss. Uncalibrated meters often read slightly off zero. Industrial EMF Detectors will often read 2-3 milligauss when placed in an open field not near, for example, power lines (either overhead or buried). High electrical activity can send some meters into overload with unpredictable readings. Paranormal researchers have often reported unexplainable wild meter swings. 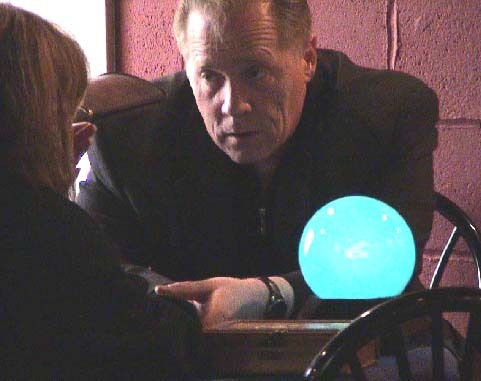 Beverly Litsinger, of Maryland Ghost and Spirit Association, frequently reports paranormal activity that sends the Grainger-supplied EMF Detectors up to 70 milligauss and beyond. Otherwise referred to as EMF meters, these devices can add an important element to any investigation. Their purpose is to detect the presence of electro-magnetic fields. Such fields can be generated by ghosts and has been related to haunting activity. Be careful of jumping to conclusions if you do get an EMF reading. First, you must rule out the possibility of an electrical or magnetic source. Televisions, appliances, electrical wires and (strangely) pipes in the walls or ground can generate EMF's. Electromagnetic field (EMF) emissions from computers, power lines and ordinary household appliances may be hazardous to your health. With EMF in the news and clients worried that they may be exposed, it's time to make a good EMF meter part of your standard equipment. When we all start out with just the simple basic Ghost Hunters tools of the trade, we usually purchase a camera, flashlight and standard tape recorder. Once we all realize that ghost hunting is becoming our passion fo rall of us we start adding more expensive equipment because we can, and not because it is required. The first expensive item besides a 35 mm and digital cameras is usually a Digital EMF Meter/ Gauss Meter. Choose a frequency-weighted EMF meter to get an EMF reading that's proportionally weighted to reflect the way in which the reading is experienced by the human body. Get an EMF meter at GhostGadgets.com (see Resources below). Opt for a non-weighted EMF meter to give you a true, non-weighted reading of EMF activity at the site. Get the best magnitude readings by investing in a 3-axis EMF meter. These meters offer 3 inductors that allow for an accurate reading no matter how the EM field or meter is placed. Take note of power lines, appliances and other sources of electromagnetic fields before gathering an EMF reading to show evidence of ghosts. These sources can all contribute to a false positive reading, so it's important to keep their location in mind both as you log your readings and as you evaluate your results. Consider the fact that some sources of electromagnetic fields are hidden from view and may not be immediately apparent. These sources include electrical wiring that's behind walls and under floorboards. Also, disturbances could be caused by any equipment containing relays, transformers, capacitors or switches. Know what a normal EMF reading looks like. Most fall between 9.0 and 30.0 on the EMF meter. Such a reading is typical for most households. Be aware of what a reading that suggests paranormal activity looks like. If you log a reading that registers between 1.0 and 8.0 on the EMF meter, you may be in the presence of spirits. Take a reading at areas of the site in which paranormal activity is unlikely. This will serve as your baseline reading. Log readings at areas of the site in which paranormal activity is suspected or has been reported. Compare readings from both these areas to draw conclusions about the presence of ghosts and other paranormal activity. 1. The frequency sensitivity range can vary greatly between models. Some can detect between 20-10,000Hz. Others may detect only between 40-60Hz. A substantial difference wouldn't you say? 2. The way in which a measurement is displayed can also be of importance. Some may only have a green and red light display allowing you to document the range in which a magnetic field is. (i.e. 2.5 to 7 milli-gauss). Others have a needle resembling the speedometer on your car. This will give you the comfort of documenting an exact reading. Still, others have a digital display. Although more expensive, the digital display will give you an exact reading to the decimal. Also, they usually have a light feature so you can see what you are doing in the dark. 3. An audible alarm is a helpful feature to consider. This will inform you of an EMF detection without having to keep your eyes on the device. This very important piece of equipment it is possible to locate and track energy sources. It will detect fluctuations in electromagnetic fields and low strength moving EMF fields that have no source. It is a common theory that spirits disrupt this field in such a way that you can tell one is present by higher than normal readings with this meter. Before using the EMF as a ghost research tool on an investigation be sure to walk around the area and take initial readings around energy sources such as light poles or electrical outlets to be sure of the readings you receive while scanning the area during the investigation. Most units when purchased come with a manual describing most household and major appliances and their corresponding electromagnetic reading. When using the EMF as a tracking device look for fluctuations of 2.0 to 7.0, this usually indicates spirit presence. Anything higher or lower is normally has a natural source. The GHOST DETECTOR / Trifield Natural EMF Meter - One Step Beyond the average EMF meter for Parapsychological and Paranormal field work - One of the most proficient and prominent quality instruments commonly employed by professional Ghost Hunters. Among the instruments utilized by paranormal and parapsychological researchers in segments of SIGHTINGS, PSI FACTOR: CHRONICLES OF THE PARANORMAL, STRANGE UNIVERSE, 48 HOURS ("Putting Paranormal to the Test"), NEXTSTEP (Discovery Channel program), the Ghost Detector (Trifield Natural EMF Meter) was invented, designed, engineered and produced by Dr. William B. Lee Phd (Physics) in late 1995. The Trifield Natural EM meter is one of the best. It is very sensitive to movement and vibration so be aware of that. One the plus side it has an audible alarm to let you know that your meter is getting a reading. Its range is approximately 25 feet.There are 3 setting we will use.Magnetic=geomagnetic fields; Electrical=electromagnetic fields; Sum=both types.The meter has an analog readout (needle) and an audio alarm that will sound.The knob on the side controls how sensitive the volume is and at what range the alarm will sound. The instrument was originally designed to satisfy the need for natural field measurements in specialized research areas. It can detect "geomagnetic storms", caused by unusual solar activity interacting with the ionosphere resulting in rapid changes of up to 10% in the Earth's magnetic field, as well as the electrical activity of ordinary thunderstorms. Ball lightning should, in theory, be associated with a strong magnetic field and magnetization of metal has been reported with some UFO sightings. When set on "magnetic", the device will signal the movement of any strong magnetic source in the sky, even if the sky is cloudy or the source dips behind a hill. The Ghost Detector / Trifield Natural EMF Meter is also called Model 1 and is the most useful of all Trifield meters for paranormal / parapsychological field work. An alkaline battery will last for approximately 50 hours of use. The radio / microwave setting is primarily useful for surveillance device detection (industrial "bugs", etc.) as well as microwave oven leaks, cellular phone radiation (enabling the user to select a cell phone with a lower RF / Microwave field emission), etc. Another version of the Trifield Natural EMF Meter was produced, the Model 2 , and equipped with a probe which is primarily useful for detecting extremely high altitude UFO's., and is available at a higher cost. Paranormal & Parapsychological Researchers find the Ghost Detector simplifies detection of entities or phenomena which disrupt existing fields, since the meter is engineered to ignore man-made powerlines and appliances, etc., eliminating a plethora of false "positives". This feature is extremely uncommon in instruments priced under $2,000! Stationary readings tend to be the most reliable. Some Ghost Detector owners position video cams, etc. to record overnight changes. Since construction materials, man-made electromagnetic devices, etc., generally do not interfere with readings, the Ghost Detector can be placed indoors and work equally well in detecting activity on the interior and exterior of the subject dwelling or building. The built-in tone allows the Ghost Detector to be used in the dark to detect rapid changes in the magnetic or electric fields facilitating twilight and evening, field scanning (including dark moon or "pitch black" conditions). The meter is sensitive to changes of as little as 0.5% of the strength of the Earth's magnetic field, and the tone will sound whether the field increases or decreases. If the magnetic field then becomes stable for more than about five seconds, the tone will stop and the needle will return to zero. The meter will remain at rest until the field changes again. The threshold level, or "squelch", of the tone is adjustable. The user determines the amount of change in the magnetic field (within a 0.5 second interval) required to sound the tone. If the field changes by the threshold amount, the tone will sound at a low pitch. If the amount of change is larger, the pitch of the tone will be higher. When the dial is set to electric, the meter is sensitive to electric fields as weak as 3 V/m (volts per meter). To illustrate just how feeble a field this is, a 10'x10'x10' room filled with a field of this strength has a total amount of energy equivalent to that required to lift a single grain of table salt 1/50th of an inch. Indoors, electric fields typically fluctuate 1 or 2 V/m. By setting the minimum sensitivity to change at 3V/m, we have designed the meter to disregard this "background noise". Human beings and animals usually emit an electric field which is easily detectable using the Ghost Detector. In fact, the instrument can be utilized as a motion-activated intruder alarm. This extreme sensitivity allows the meter to detect the presence of a person through a wall. Though not foolproof in this capacity (occasionally a person will carry no electric charge and thus be "invisible" to the meter), the extraordinary sensitivity is of interest to researchers in the field of parapsychology, especially "ghost hunters". Electromagnetic field detectors are very useful tools provided they are used properly. There are instructions with each type that you should read. These meters detect fluctuations in Electromagnetic fields.EM fields are normally generated by electrical appliances and other items such as computer monitors, cell phones, etc.They are also created by the weather in outer space such as geomagnetic storms and solar flares.When you find an unexplainable field, normally between 2 to 7 milligauss, it is associated with spirit activity.These meters are will not always detect a spirit present, but they are another helpful tool is tracking ghosts.EMFs are measured in units called milligauss. The Electrosensor EMF meter (on left) has a range of 3ft and a light up led display. It can give you readings within 1 milligauss. This meter is only on when the button is depressed and held. The ELF Zone EMF meter (on right) has 3 lights; the middle yellow light is almost exactly the range we are looking for during an investigation (2.0 to 7.0) its range is 10-12 feet. The Gauss Lites meter.This meter is only on when the button is depressed and held.The green lights start in the 1.5 milligauss range so any reading the in the green is positive.Its range is about 8 feet. The Cell Sensor EMF meter has a base unit with a small probe that plugs into it.When the probe detects EMFs the base unit will give off an audible alarm, the red portion of the meter will blink and the needle will read the amount of milligauss detected.It has a range of about 10 feet. Different things can give you false positive readings when you are near them.Some of these things generate EM fields that surround the object and are a few feet thick so you do not have to be right on top of it to get a reading.Even a 2 - 7 milligauss reading can be given of by something natural so try to trace out a source.This is essential indoors. Some have recently reported that ir will also pick up a pacemaker, and hearing aids. Also known as "Dr. Gauss"
This little meter measures the level of ELF magnetic field radiation from power lines, computers, kitchen appliances, and more! The easy to read scale, unique built-in audio signal and auto shut-off make it simple to use and a great way to find hidden sources of ELF frequency magnetic fields. Most experts agree that chronic exposure to more than 2.5 milli-Gauss is inadvisable. This meter will show you which areas are above or below 2.5 milli-Gauss in the 50 - 60 Hz frequency range. Hand-held, lightweight and durable, with two easy to read scales (0-1 mG, & 0-10 mG), and dramatic audio signal. Our favorite meter for demonstrating the presence of dangerous EMFs to others and paranormal work. Requires one 9V battery (not included). Calibrated at 50-60 Hz. Made in China, where QC is not quite what it should be. Includes nice instructions on how to perform a proper survey of your home, office, or school yard. SUGGESTED GHOST HUNTING PARANORMAL INVESTIGATION TOOLS OF THE TRADE FOR YOU TO PURCHASE. SHOP HERE NOW! Gaussmeters, Electric Field Meters, and EMF Detectors of All Kinds. Most homes and offices have hot spots with strong artificial electro-magnetic fields, where chronic exposure may cause mental or physical problems. AC gaussmeter, electric field meter, RF field strength meter combined in one electromagnetic instrument. Manufacturers of low-cost gauss meter; EMF, RF and ion detectors. What if someone told you the piece of ground you were standing on was known as the "Most Haunted Scariest Spot in the world"! Would you believe them? Whitechapel, Sloss Furnace, Amityville, Spittalfields, London East End, London, England, Gettysburg, Pennsylvania, Auschwitz-Birkenau Concentration Camp, Oswiecim, Poland, Amityville, NY, or the Waverly Ghosts of the Kentucky Sanatorium, Bachelor's Grove, Bald Mountain Or The entire Haunted City of New Orleans. It's all up to conjecture... Haunted America Tours lets People who visit the site vote to see what they believe is the most haunted location, other paranormal sites, and television shows pick and choose their haunted places for you. THIS STORY MAY JUST PUT A NEW REAL HAUNTED HOTSPOT ON YOUR LIST OF REAL SCARY AND MOST HAUNTED PLACES TO INVESTIGATE! TO READ MORE PLEASE VISIT HERE NOW! The above article and Photos does not necessarily reflect the views or opinions of Haunted America Tours.